There are many benefits to having your Carpets Cleaned in Birmingham, AL. Having your carpet professionally cleaned helps eliminate trapped dust and pollen that could be contributing to allergies. According to a report by the American Lung Association, dust accumulation in carpet and rugs can adversely affect members of your household who suffer from conditions that can affect their breathing, such as snoring or asthma. One of the properties of carpet is that it absorbs and traps dust from the air. So, even though pollutants are pulled out of the air to the carpet and are trapped in the carpet, you don’t want them in your house. Vacuuming regularly helps remove some of these. But, yearly professional carpet cleanings are recommended to get the rest of these trapped contaminants out. According to the Environmental Protection Agency, a dirty carpet can retain several sources of indoor air pollutants, including pet dander, cockroach allergens, lead, particle pollution, and everyday dirt and dust. Toxic airborne gases can also adhere to these particles and get trapped within the carpet. These pollutants are released back into the air every day from normal activities such as walking across your carpet. Even vacuuming your carpet can stir up dust and dirt that may not be totally sucked up by your vacuum. And, even if you are the best housekeeper in the county, you may not be able to get all this dust and dirt out on your own. This is why manufacturers recommend having your carpets professionally cleaned at least once a year. Heaven’s Best Carpet Cleaning has top of the line equipment and professional strength cleaning products that will thoroughly clean the pollutants out of your carpet. We have specially formulated cleaning solutions that will kill many forms of bacteria that are harbouring in your carpet, but our solutions are also environmentally safe. So, although they are strong they are safe for your, your children, your pets and your home. If you haven’t had your carpets cleaned this year, it’s about time! Call Heaven’s Best Carpet Cleaning today at (205) 618-9150. 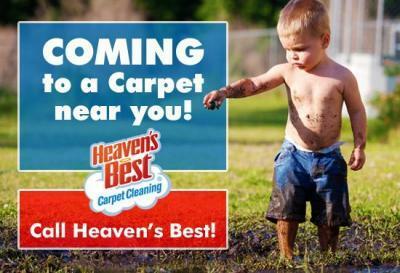 Along with getting rid of dust, dirt and other particles, Heaven’s Best will make your carpets look and smell great. Don’t forego the great benefits of a carpet cleaning in Birmingham AL, call (205) 618-9150 today to schedule your yearly cleaning.